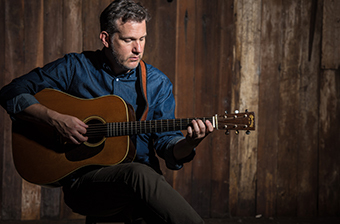 Bryan Sutton is arguably the best flatpick guitarist since the late great Doc Watson. During his eclectic career, he has appeared as a leading session guitarist on albums from Dolly Parton, the Dixie Chicks, Rhonda Vincent, and more. He has also played in the legendary bluegrass bands Kentucky Thunder and Hot Rize. Bryan picked up guitar from his dad at the age of 8 and won his first Grammy award in 2007. He's received IBMA's 'Guitarist of the Year' eight times. Bryan joined the ArtistWorks family in 2011, launching a dedicated bluegrass guitar course for students around the globe. "Fireball Mail" (Basic) - NEW! “I Am a Pilgrim” (Basic) -NEW! "Fireball Mail" (Intermediate) - NEW! Community Arrangement Project - Beaumont Rag -NEW! "I Am a Pilgrim" (Intermediate) -NEW! "Fireball Mail" (Advanced) - NEW! "I Am a Pilgrim" (Advanced) -NEW! Bryan Sutton is a master teacher! Am very pleased with my instructor, Bryan Sutton. Have not used video exchange as much as I should, but am impressed with the sight overall. Amazing guitar lessons by Bryan Sutton! I've been doing the online course with Bryan Sutton for about a year and a half, and I LOVE it! For the first time in years, I've been able to see a noticeable difference in my playing. I can see improvement that I didn't see while using method books. This is hands down the BEST way to learn bluegrass guitar! Bryan is an incredible teacher and shows you how to become a master of flatpicking in a way that's easy to understand and at your own pace. I very highly recommend his course! I'v I'm extremely pleased with the Brian Sutton bluegrass guitar instruction. The videos are clear and well constructed. I've completed the beginner course and am just starting intermediate. I can't speak for the other courses but if this is their standard, I highly recommend giving your selected course a try. ArtistWorks is an Excellent Resource: Brian Sutton is the Real Deal! I am a casual user of Artist Works because I use it as a resource to supplement other instruction and playing opportunities I have. As a result, I haven't participated in the communal online experience. But I do find the website to be very useful with resources and information that are helpful and easy to find. Having taught in an online environment, I know effectively communicating with students can be a formidable challenge. But Brian Sutton does a very good job of explaining techniques and strategies so they are more easily understood. Frankly, the fact that he spends as much time as he does on submitted videos is pretty remarkable, especially considering the wide range of ability and apptitude of his students. I have recommended Artist Works to a number of people because I think it can be a valuable tool and I'll continue to do so. This is the best online music lesson site, hands down. In fact, I’ve learned more from Bryan Sutton since December than any private lessons I have taken in the last 20 years. This is an amazing value! I have learned so much with Bryan Sutton as my instructor. It’s still amazing to me that I can learn and receive feedback from someone of Bryan’s caliber. I highly recommend Artist Works. I feel privileged to be able to have Bryan Sutton as my bluegrass guitar instructor and am constantly telling my friends about the site. I'm always amazed at the quality of his video responses. My only complaint is that I don't have time to take any of the other instrumental courses! Best online instruction - period. Heck, its even better than in-person teaching in many ways as you can go back and review the instructions again and again. Last and most importantly, it’s simply not possible to find a local teacher in Denmark that master the bluegrass guitar like Bryan Sutton. Artistworks platform makes this available to me! Bryan Sutton is awesome!! Website is easy to navigate. Love it!!! Bryan Sutton is an amazing teacher. He is able to convey his method of playing clearly and concisely. His critique is always direct but positive. Although I haven't submitted many video exchanges his instruction has definitely moved my playing along. I have had music lessons since I was about 8 years old and these are some of the best I have had including in college. You can work at your own pace and really understand and absorb the lesson. Onus is on you to make the most of these lessons. Great platform. Well though out, progressive, comprehensive program. So much material to access. A great deal. I have been enrolled in Bryan Sutton's Bluegrass Guitar school for almost 4 years. He has taught be to do things on flat pick guitar that I never thought I'd be able to accomplish. These classes are amazing, no matter what your ability or experience level is. And, using the annual rate, they are quite inexpensive, especially considering you not only get the on-line lessons, but personal, one-on-one instruction via video exchange. Artistworks is simply the best on-line instruction I've ever encountered.